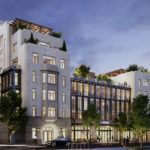 Playhouse District Pasadena 72 Unit Ground-up luxury condo project offering sophisticated condominium residences in the highly desirable Pasadena Playhouse District. The project features high-end design, well-appointed gardens and a location with easy access to great restaurant, shopping, and cultural venues. The central location and beautiful design will appeal to target buyers and generate healthy demand at a premium price. Beta3 Group performed: Marketing and Financial Feasibility; Owner Representation for Sale.